Growing up in the fifties, on the outskirts of a small, rural town was very lonely as an only child. My parents had hoped to have more children, but God had a different plan. My parents were kind and generous, but strict disciplinarians. There was much focus on achievement and completing tasks well, and not a lot of room for the silliness and nonsense play that a little girl yearns for. I remember occasionally leaving my organized home, so quiet you could hear a pin drop and being invited to visit for a few hours the crazy chaos of a friends’ home that had numerous siblings! How I loved the noise, the laughter and all the hustle and bustle of their homes! I begged to stay longer, not wanting to return to my books, dolls, and coloring books which were my constant companions. I believe that being an only child has shaped me into the introverted, task oriented person I am today. It also forced me to become an imaginative creative person. Because I played alone 90 % of the time, I dreamed up wild, adventuresome lives for my dolls and spent many hours constructing the necessary props for my play from fabric, paper and glue. About now you are probably thinking… “Oh good grief… Quit your whining! It wasn’t all that bad”. And you are absolutely right… My only reason for even boring you with my ancient history is to demonstrate how very much our family of origin molds and shapes our personality into who we become as adults. Walk By Faith Embroidery from Bob Weidman on Vimeo. So fast forward about 50 years and I find myself at a crossroad in my life. My three children are grown and married. I have a job that pays well, is a pleasant enough work environment, but I have this huge yearning to use my creative talents. I sit at work sketching in my journal all the ideas I have for super kid capes, soft adorable baby blankets,etc, etc. (You get the picture!). I decide, with my awesome husband’s blessing!, to leave my job and begin to bring some of my sketches to life! Just like I did all those years ago alone in my room creating exciting adventures for my Barbie dolls! But this time, I am not alone, because I now have a Brother! A Brother embroidery machine , that is! My brother and I are getting to know each other well because we spend LOTS of time together these days! I know when he needs a new needle, or a cleaning, or a heavier stabilizer just by the sounds that he makes! Together we are transforming fabrics and thread into the creations that I have been envisioning! There has been a huge learning curve, but I am so happy as I now feel I am using the gifts and talents that God gave me so long ago! I wake up everyday excited about the next project I am going to begin. I thank the Lord and my parents for instilling perseverance, creativity and a vivid imagination in me. 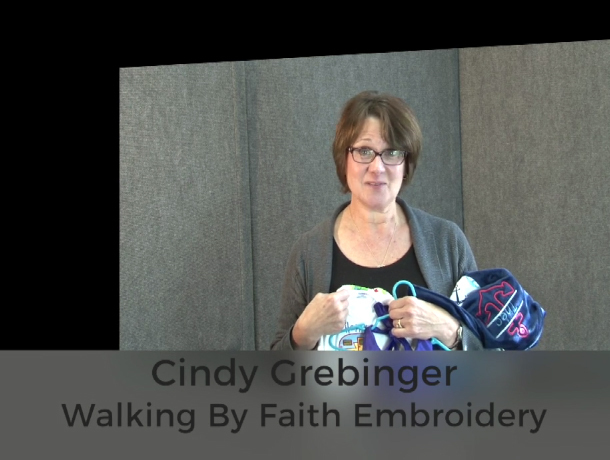 I have named my new endeavor, Walking by Faith embroidery. One creation and project at a time I am following my heart and operating out of my God given strengths! What an awesome, blessed place that is to be!